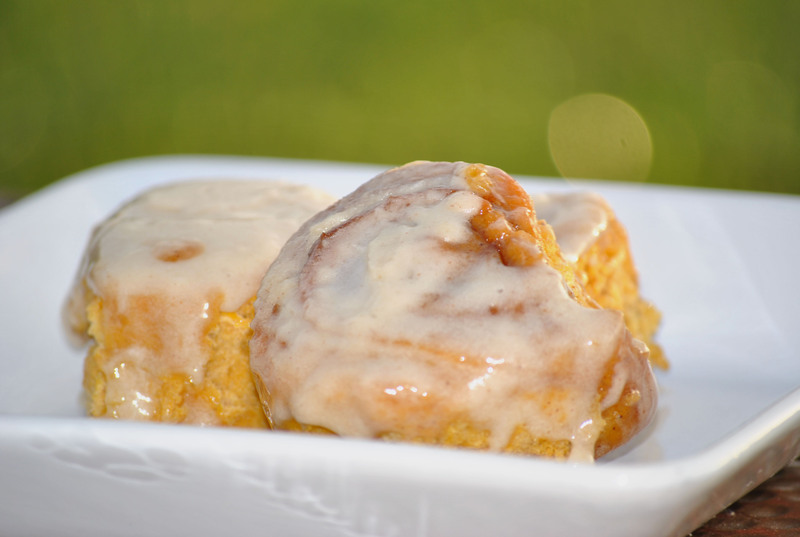 Is it me, or do you think of pumpkin in the fall? It’s like I can’t get enough of that squash. When Meeshie was small we would always visit a pumpkin patch. We carve pumpkins just to enjoy the pumpkin seeds. Pumpkin flavored coffee is available at Dunkin Donuts. I’m partial to Culver’s pumpkin pie shake. As far as I know, the flavor is on their menu all year long, but I only want it now, when the weather is warm during the day. I’ve made my share of pumpkin treats, but this next one is in my top five. I made this along with the pumpkin donut muffins last weekend. Oh, the aroma of pumpkin wafting through my kitchen…. 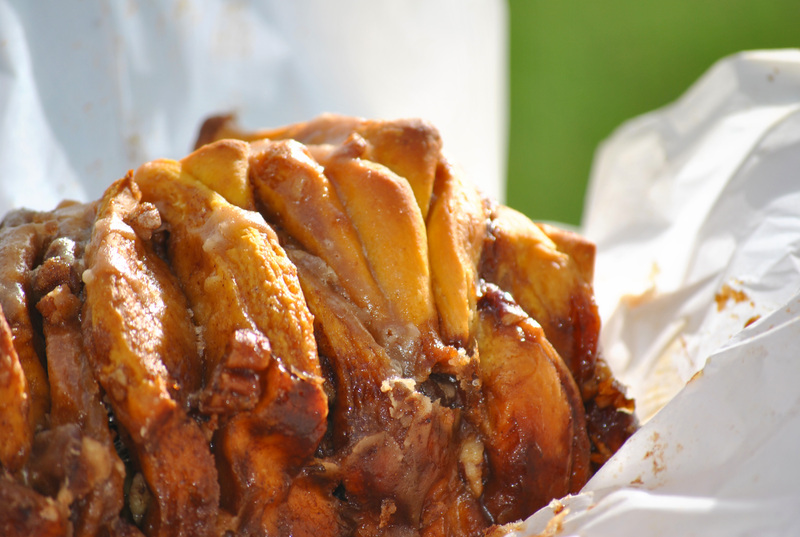 Pull apart bread is quickly becoming my favorite treat. I think it’s easier and less messy than a sweet roll. It’s easier to roll out the dough, add the filling and cut it to set inside the bread pan. Serving it is easier too; you can control the serving size when cutting the loaf. I made this bread twice but did not double the glaze. The glaze was the perfect amount for two loaves of bread. Notice I didn’t say I doubled the recipe. I’m not sure it can be doubled easily. Try it and let me know. In case you’re not aware, I bake a lot, but I don’t have luck with doubling a recipe unless it is stated. So, I made the dough twice, which wasn’t that difficult. I set up my mis en place and ran with it. If you are still afraid to use yeast, try this. Truly it’s pretty fool proof. How do you know your yeast is working? By the happy bubbles in the bowl, plus it will smell, for lack of a better term, yeasty. No bubbles, then your yeast is probably bad and you can start again. Don’t continue on, hoping the yeast will start to work. It won’t. Just get yourself some fresh yeast and soldier on. What we loved about this bread was the fact that it wasn’t overly sweet. That’s the problem sometimes with cinnamon rolls, too sweet. Not this, the glaze is perfect and the rum just mellows the glaze. It’s not something that is very prominent. The nuts inside the layers are divine, but for those with the dreaded allergy, substitute the nuts with raisins and toasted pumpkin seeds. And please, please, brown the butter. I love the nuttiness of browned butter and it really does complement the pumpkin. What’s your favorite pumpkin treat? In a saucepan over medium-high heat, brown 2 tablespoons of butter, letting it bubble up and turn a dark golden brown but being careful not to allow it burn. Once browned, remove the pan from the heat and carefully add the milk, return to stove and heat through. Pour the milk and butter into the bowl of standing mixer (fitted with a dough hook) and allow to cool so it is no longer hot but also not cool (about 100-110 degrees F). Once it has reached a warm but not hot temperature add the yeast and 1/4 cup of sugar and allow to proof (this can take up to 8 minutes, the top will look foamy and the liquid cloudy). Then add the pumpkin, salt, and 1 cup of flour. Stir until combined then add the rest of the flour 1/2 cup at a time and knead for 6 minutes, until the dough is smooth and elastic and just slightly sticky. If the dough is too moist, add extra flour 1 tablespoon at a time. Move dough to a lightly oiled bowl and cover with a clean towel. Allow to rise in a warm place for 60-90 minutes or until doubled in size. While dough is rising, brown another 2 tablespoons of butter. Add the sugar, pumpkin pie spice, pecans and ginger and mix well. Set aside. Next, line a 9×5 loaf pan with parchment paper and set aside. When the dough has doubled in size, punch it down and flip out onto a clean floured surface and knead with hands for 1-2 minutes. On a lightly floured work surface, roll out the dough into a 20-by-12-inch rectangle. Spoon the melted butter/sugar mixture generously over the dough. Cut the dough crosswise into 5 strips, each about 12 by 4 inches. (A pizza cutter is helpful here.) Stack each strip on top of one another. Cut the strip into six equal slices again. You’ll have six stacks of six squares. Layer the dough squares in the loaf pan. While there is plenty of space on either side of the strips widthwise in the pan, fitting the strips lengthwise is tight. But that’s fine because the spaces between the dough and the sides of the pan fill in during baking. Loosely cover the pan with plastic wrap and let the dough rise in a warm place until puffy and almost doubled in size. In the meantime preheat an oven to 350 degrees. After rising in the pan bake for 30-40 minutes or until top is a very deep golden brown. To prepare the glaze, brown the butter, add the milk, and brown sugar in a small saucepan. Bring to boil then immediately remove the pan from the heat and stir in the rum and powdered sugar. I discovered something about my husband this summer that I never knew. Or maybe, to be fair, I always knew it, but could never persuade him to change his mind. You see, although my husband loves breakfast food, I’ve never gotten him to enjoy a waffle. The closest he’s come to one during all the years we’ve been together is the kind that comes out of a box in the freezer section of the grocery store. And believe me, I’ve tried to persuade him. I’ve got tons of great recipes, but he’s always just shrugged and said they were okay. Anyone that spends any time in the kitchen knows that telling the cook it’s okay is worse than saying please don’t make this again. Nothing is more frustrating than spending time making a meal for someone and encountering indifference. Oh, but our wonderful trip to Texas changed that. First, Meeshie had a waffle for breakfast almost everyday. And, even though she and I share most of our meals, I couldn’t eat the same thing as often. Not when one of the best things about vacation is trying the local cuisine. Therefore, my husband finished quite a few of her meals. It’s that Catholic guilt which can get really tricky when you can’t bring home your leftovers. Since we’ve been home, I’ve made waffles more times than I had since I’ve been married. Let’s just say, it’s been a lot. I don’t mind. I love waffles. This recipe is simple but does require some planning. You make most of the batter the night before to allow the yeast to work its magic. This allows for a super light and airy waffle. Crisp on the outside and fluffy on the inside just as it should be. 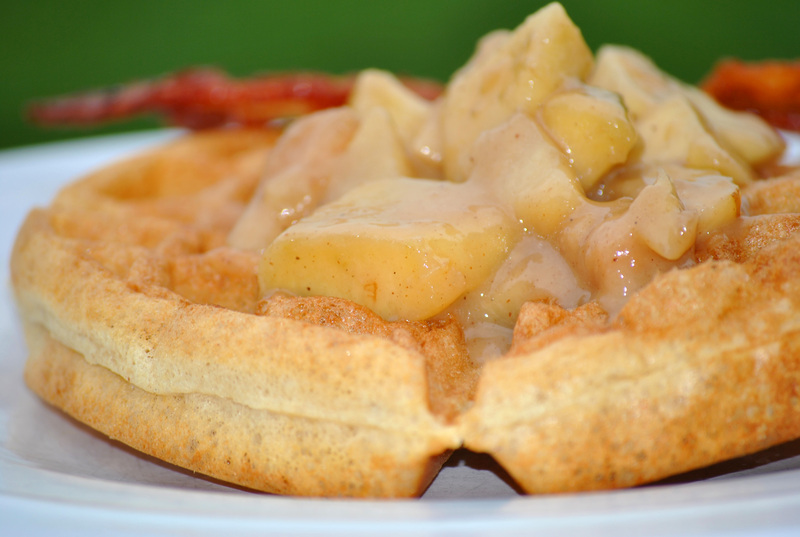 I serve them with an easy apple pear compote. The compote can be made a day or two ahead and reheats easily. Combine the warm water (110 degrees), sugar and yeast. Let stand for at least ten minutes. While yeast is foaming, melt the butter in a small saucepan and add the milk until it reaches 110 degrees. In a large bowl, combine the flour and salt. Slowly add the milk mixture and the yeast mixture. Combine until the batter is smooth. Cover tightly with plastic wrap and let stand overnight (or for at least eight hours) in a room temperature area such as the counter. DO NOT REFRIGERATE. Add the eggs, vanilla, baking soda, cinnamon and nutmeg to the batter. Mix thoroughly and let stand for five minutes. Preheat the waffle iron. 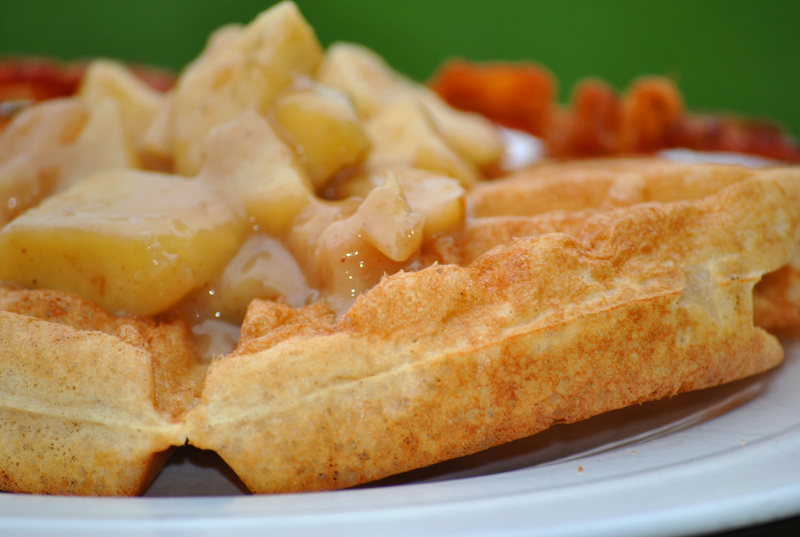 Pour batter into waffle grids. Close cover and bake until golden brown, about 2-4 minutes. Remove waffle from iron and place on a cookie sheet. Place cookie sheet in a low oven, about 200 degrees to keep warm until ready to serve. Zest the lemon and set aside. Place the apples and pears in a medium mixing bowl. Squeeze the lemon juice over the fruit, then toss fruit with the sugar, cinnamon, ginger, salt and nutmeg. Melt the butter in a large skillet over medium-high heat until brown. Add the fruit and cook, stirring until the sugar dissolves and juices simmer, about 2 minutes. Reduce heat to medium, and cook, uncovered, until the fruit softens and the juices evaporate some, about 10 minutes. Evenly mix the flour into the fruit; then cook about a minute more to thicken the juices slightly. Stir in the vanilla and lemon zest; and remove from the heat. Serve over the waffles. You can also serve the compote with your favorite pancakes or oatmeal. I know I’ve mentioned this before, but I love bread. All kinds of bread. I also love making bread. I came across a recipe recently that I knew I had to try at my earliest opportunity. I’m so glad that I did. 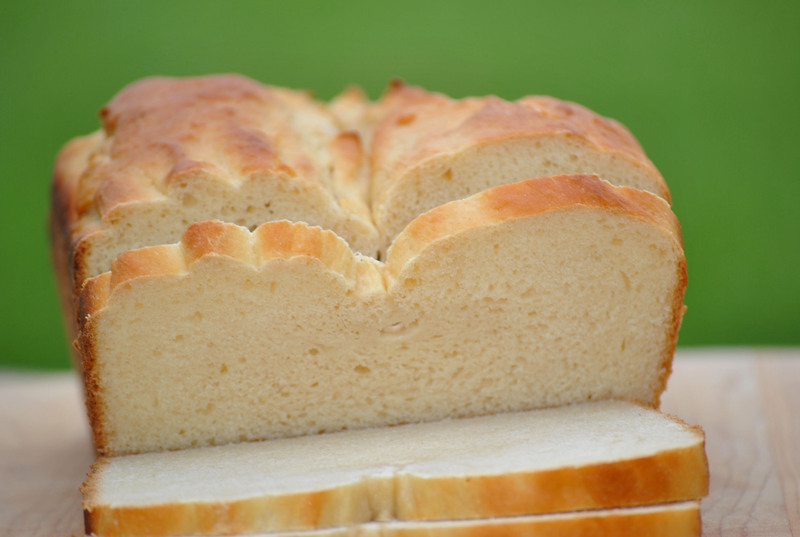 This recipe is so simple and it’s one of the best breads I’ve ever made. I think that says a lot, because I’ve made my fair share of bread. What I love about this bread is that it’s fool-proof. What do I mean by that? Well it uses yeast, and although I’m a lover of all things yeast, I don’t like to use it too often in the summer. The humidity can make it temperamental. And it has been more than humid around here. Hot and humid is one of the joys of summer in the midwest. But this recipe puts the four ingredients together and you just forget about them for at least 12 hours. You don’t have to stress about water temperature. 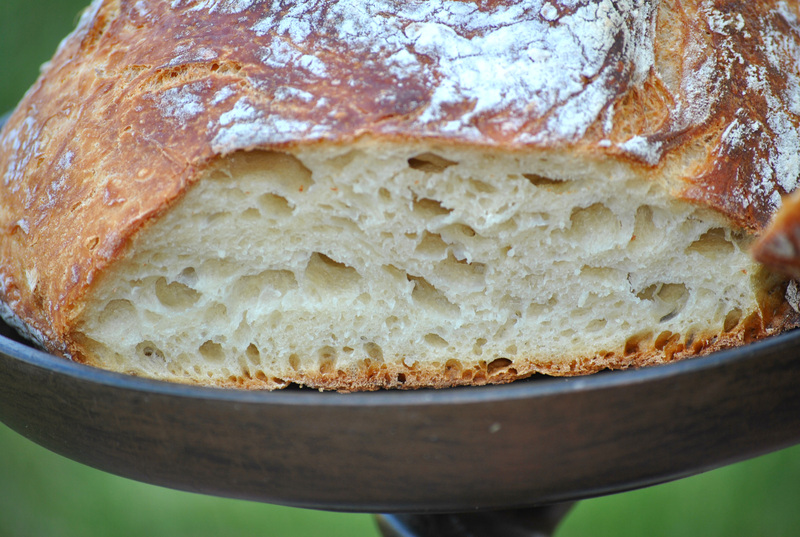 The longer you allow the yeast to feed, the yummier your bread will be. It’s almost like make a starter for your bread. Fool proof, I tell you! 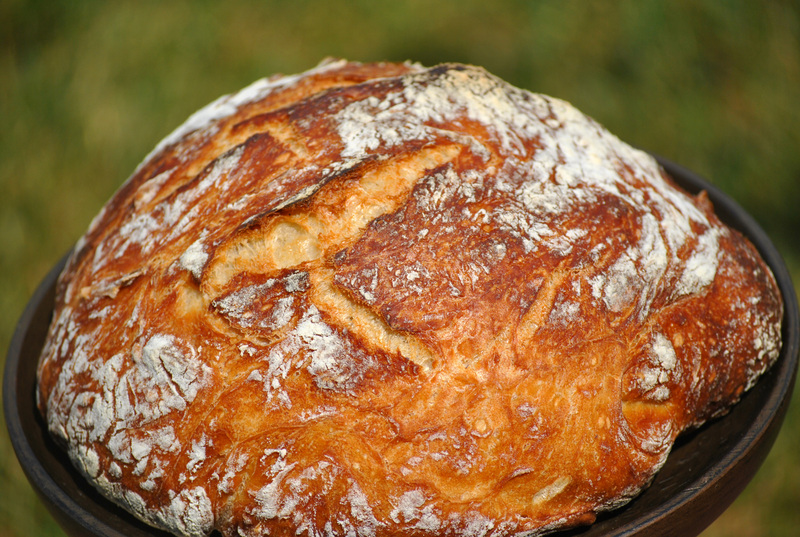 The other great thing about this bread is that you bake it inside an enameled cast iron pot. I have a beautiful one from Sur La Table, but feel free to use your Staub or Le Creuset one. Baking inside the pot is what gives it that wonderful crusty crunchy texture. This bread is great on a sandwich, or just sliced and eaten with some butter. In a large mixing bowl, whisk together the dry ingredients. Add the water and mix until combined. It will be very loose. Cover the bowl with plastic wrap and set aside, on the counter, for 12-18 hours. Do not refrigerate. Trust me, once the dough has sat for at least 12 hours, you will have a happy little yeast community. Once the dough is ready, heat the oven to 450 degrees. Place the pot in the oven, covered, for 30 minutes. While the pot is heating, place the dough on a heavy floured surface and shape into a ball. Place the dough back into the bowl and cover with plastic wrap. Once the pot has been in the 450 degree oven for 30 minutes, remove it and place the dough inside. Cover the pot and bake for 30 minutes. After 30 minutes, remove the lid and bake for an additional 15 minutes. Remove the bread from the oven and place on a cooling rack. That’s it, no need to grease the pot. So easy and delicious! I know it’s not a surprise that I love to bake. I especially love to bake bread. For the last six months I’ve actually taken the plunge and started to use King Arthur flour. I say the plunge because King Arthur flour is not cheap. Luckily my local Target sells it at a reasonable amount. This flour is worth every penny I pay for it. It’s fantastic. Do you know what else is fantastic? The King Arthur website. They have some wonderful recipes. Like their recipe for brioche. 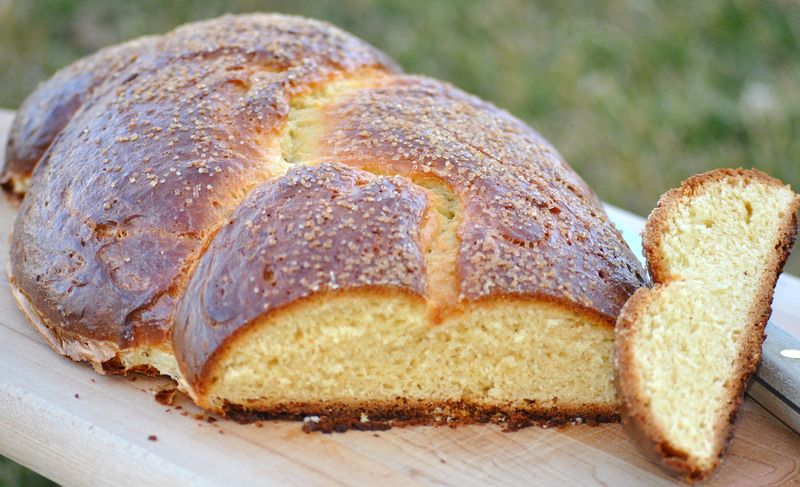 Brioche is a sweet bread made with eggs. It’s also one of the best breads to use for french toast. 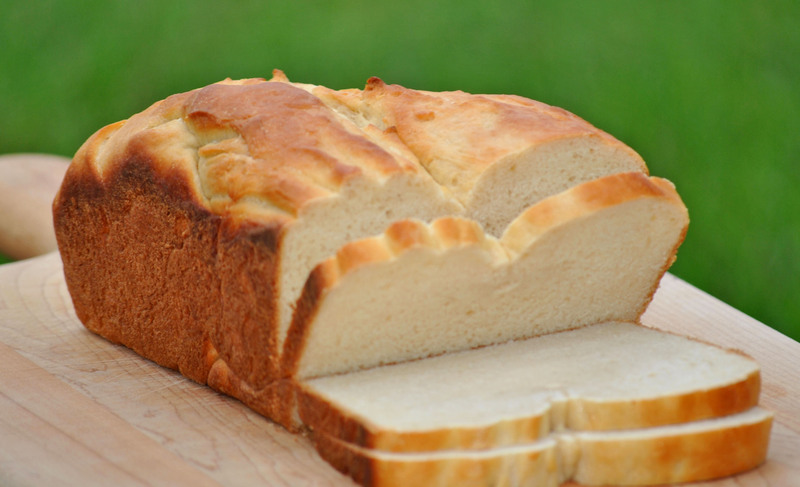 With this recipe you can make mini brioche, one large loaf or two loaves. You can braid the loaf, or make it traditionally as a topknot. The only thing to keep in mind is that it browns quickly. That means that it may look done, but it isn’t. So check on it frequently and tent it with foil as soon as it gets that deep brown. I love to just slice this bread, toasted it slightly and spread some blueberry jam on it. Using a stand mixer, mix together all of the ingredients to form a smooth, shiny dough. This will take about 15 to 20 minutes. Do not knead by hand. Once the dough is shiny and smooth, form into a ball and place it into a greased bowl. Cover the bowl and let the dough rise for at least an hour. Place the dough in the refrigerator. Refrigerate for at least 2 hours and as long as overnight. This will allow the butter to chill, making the dough easier to shape. Divide the dough into three equal pieces and braid. Place the loaf on a parchment lined cookie sheet and allow to rise for 2 1/2 to 3 hours, until doubled in size. 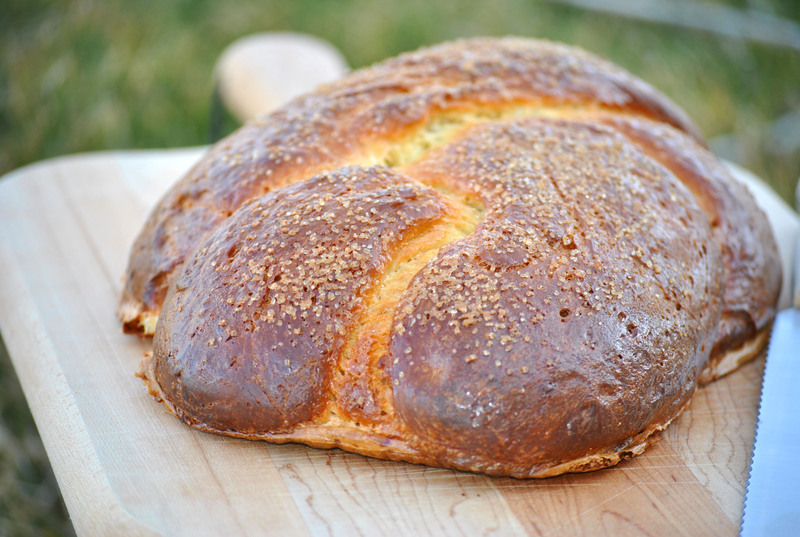 You can also shape it into a large round traditional brioche; make mini brioche or make two loaves. You can also place the dough into two greased bread pans. Once the dough has rested and risen, whisk the egg whites with a small amount of milk and brush on the loaf. Sprinkle with raw sugar. Bake the whole loaf in a preheated 400 degree oven for 10 minutes. Reduce the heat to 350 degrees and bake for 30 to 35 minutes. Check every 10 minutes and if the loaf becomes too brown, tent with foil. Brioche should be deep brown and sound hollow when tapped. For the mini brioche, bake in 375 degree oven for 25 to 30 minutes, checking every 10 minutes and tent if necessary. For two loaves, bake in 350 degree oven for 40 to 45 minutes, checking every 10 minutes and tent if necessary. For the mini brioche, combine 1 C confectioner’s sugar, 1 t vanilla, and enough milk to drizzle on top. I wanted to try some different rolls this year for Thanksgiving. I love making bread. There’s something about working with the flour and yeast that makes me happy. 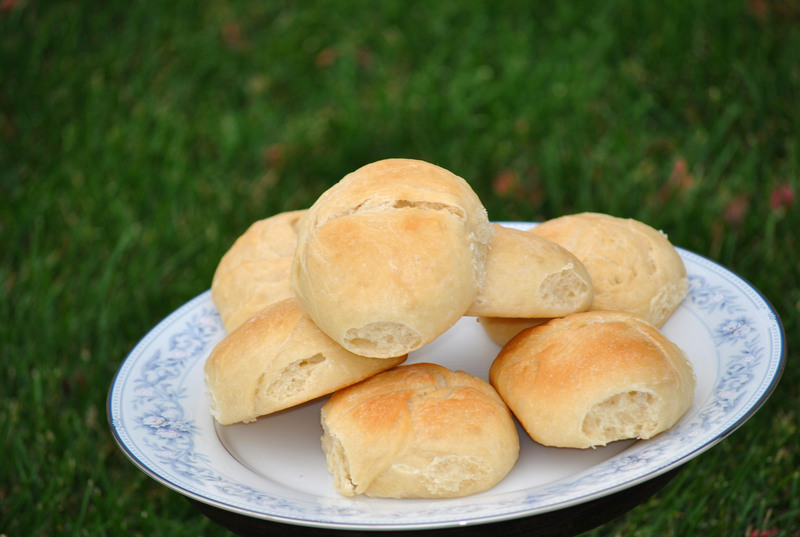 These rolls are simple to make. They’re perfect side to any meal. They’re also a perfect size for a little sandwich. Are you wondering what to do with your leftover turkey? 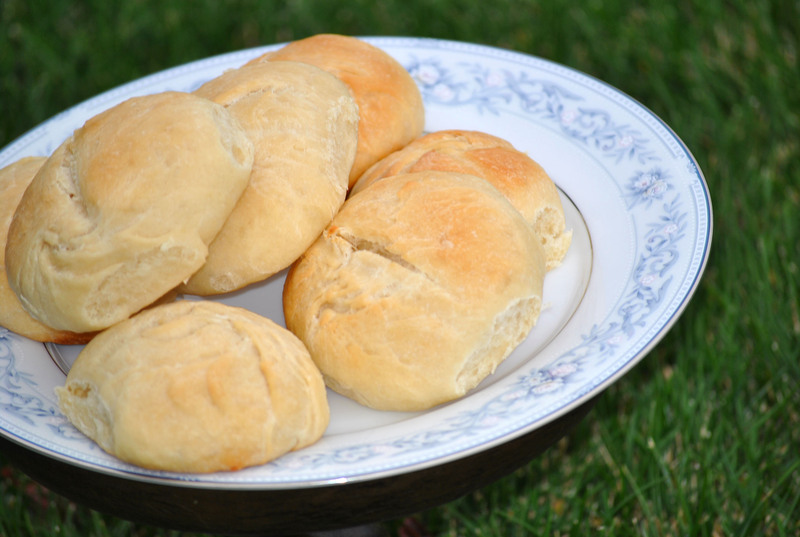 How about a little sandwich with these rolls? I made two batches of these rolls for Thanksgiving. I gave the handful away to my sister and her family. My nephew loved them. I made another batch yesterday afternoon, just in time to have mini sandwiches of leftover turkey and ham. My husband may request the mini sandwiches again today for lunch. I may use my Panini press to make hot sandwiches. How about a nice ham sandwich with mustard, swiss cheese and pickles? Or would you rather have a turkey sandwich with mayo, red onion, salt and pepper? The great thing about these rolls is that you can start them a few days ahead, just make sure they are covered well with Saran. I actually made the dough, prepped them and put them in the fridge on Monday night. Thursday morning I took them out of the fridge and let them sit out until they got room temperature. Then about a half an hour before mealtime, I melted my butter and then put them in the oven. I actually used only 2 T of butter for the doubled batch, so if you only make one batch you may want to adjust the butter. I also made sure to rotate my pan half way through the baking process. In a sauce pan, melt 6 T of butter. Add the milk and heat until lukewarm. Set aside. In a small bowl, stir together water, 1 T sugar and yeast. Let stand until foamy, about five minutes. In a large bowl, combine the remaining sugar, 2 C of flour and salt. Add the yeast mixture to the milk mixture and then add to the flour mixture. Use a rubber spatula or wooden spoon to combine the dough. Dump about 3/4 C of flour onto a clean work surface and scrape the dough onto the flour. Work the flour into the dough. If your dough is too sticky, add up to 1/2 C more flour slowly until the dough is just slightly sticky. Knead the dough until smooth and elastic, about 5-8 minutes. Form the dough into a ball and place in a large, buttered bowl. Make sure to turn the dough in the bowl to coat, cover with Saran and let rise in a warm, draft free place for about an hour. Once the dough has doubled in size, divide the dough into 20 equal pieces. Roll each piece into a ball and arrange on a buttered 9×13 pan. Cover loosely with Saran and let rise again for about 45 minutes. Using a floured bamboo skewer, or chopstick, make a deep crease down the center of each row of rolls. Preheat the oven to 375 degrees and place them in the center of the oven. Melt the remaining butter and brush the tops of the rolls. Bake for 20-25 minutes or until golden brown. You can reheat the leftover rolls in foil in a 350 degree oven. We love cinnamon rolls. I make them a few times a year, keep them in the freezer and then reheat them for a quick morning treat about once a month. I even give them away at Christmas. There’s nothing like the smell of cinnamon rolls while they bake in the oven, especially on Christmas morning. But it’s also the time of the year when I obsess over pumpkin: pumpkin whoopie pies, pumpkin pie, pumpkin roll, pumpkin muffin donuts are just a few of the things I love to make. 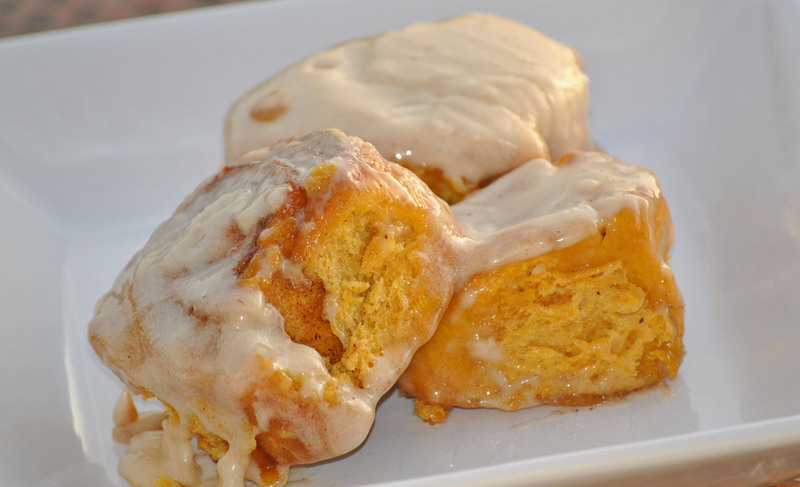 I saw this recipe for pumpkin cinnamon rolls and I knew that I had to make it. The recipe needed to be altered due to the fact that I no longer have a bread machine, plus I doubled it to so that I wouldn’t have any leftover canned pumpkin. All I can say is wow! This is so good. It’s an unexpected twist on a favorite. I’m looking forward to enjoying this for breakfast the morning of Thanksgiving, too. It’s a perfect make ahead dish that will really get you in the mood for fall. If you do plan to freeze them, ice them and then wap them in Saran and then foil. Reheat them in the oven at 350 degrees for about 10 minutes if thawed and about 20-25 minutes if frozen. You’ll know they’re ready to take out of the oven once you start to smell the cinnamon. Just keep an eye on them, you don’t want them to dry out, you’re just re-heating them! Combine the milk, butter and sugar in a sauce pan. Scald the milk mixture. Set aside for about 25-30 minutes. Add the dry yeast to the milk mixture and let it set for a minute. Add the eggs, flour, salt, cinnamon, ginger, nutmeg, and pumpkin to the yeast mixture. Blend well, the dough will be tacky. Place the dough in a greased bowl, cover with a damp towel and let rise for an hour. Generously flour the counter, place half of the dough on the counter and knead slightly. Roll the dough into a 9×12 rectangle. Combine the brown sugar, cinnamon, nutmeg, ginger and allspice in a small bowl. Using your hands, spread some of the melted butter on the dough to cover , then add half of the brown sugar mixture. Starting from longest side of the dough, tightly roll the dough toward you making sure to seal it once you have finished rolling it. Use a sharp knife and cut the dough into 1 to 1 1/2 inch pieces. Using some of the melted butter grease your pan(s). I use the round aluminum cake pans, but use whatever you feel comfortable with. I like the pans because they are easy to freeze, they allow for about 8 rolls and they are easy to give away. Repeat with remaining dough. Cover and let rise again for another hour. Bake in a 375 degree oven for 20 minutes, or until golden brown. While they are baking, make the frosting. Cream the butter and cream cheese together. Add the syrup, vanilla, pumpkin pie spice and powdered sugar. Spread over the warm rolls. This makes 4 pans of cinnamon rolls. Do you remember that last week I mention that I had made two great breads, one savory and one sweet? I posted about the pesto bread, but I’ve waited to share this sweet one. Did you know that bread is my favorite food? It’s true. I don’t remember why I came across this recipe, but I’m glad that I did. I do know that I found it sometime during the summer and have been waiting to make it. I don’t know about you, but I don’t like to work with yeast when it’s too humid. Even with the air on, it can react strangely to humidity. This bread isn’t actually too sweet. It’s perfect for a sandwich. But it’s also perfect toasted with a bit of jam for breakfast. It would also make a great french toast. I also think it would be good with whole wheat flour. This is another yeast bread, but again don’t be afraid of it. Give it a try. I’ve made two loaves in less than a week. In a small sauce pan, melt the butter over low heat. Turn off the burner and add the milk, honey and yeast. Set aside for at least 5 minutes. In a medium-sized bowl, combine 2 C of flour and salt. Add the milk mixture to the flour and combine until smooth. Add the last the cup of flour slowly and mix by hand. Once combined, turn out on a floured surface and knead for 10 minutes. Place the dough in an oiled bowl, turn to coat all sides. Cover with a damp towel or plastic wrap and let rise until doubled in size; about 1 to 1 1/2 hours. After it has risen, punch down the dough and turn it out onto a work surface and form into a loaf. Place the dough into a greased bread pan. Allow the dough to rise until doubled in size, about 40 minutes. Just before baking, split the top with a knife and drizzle some honey in the slit. Bake at 400 degrees for 20-25 minutes, or until golden in color.